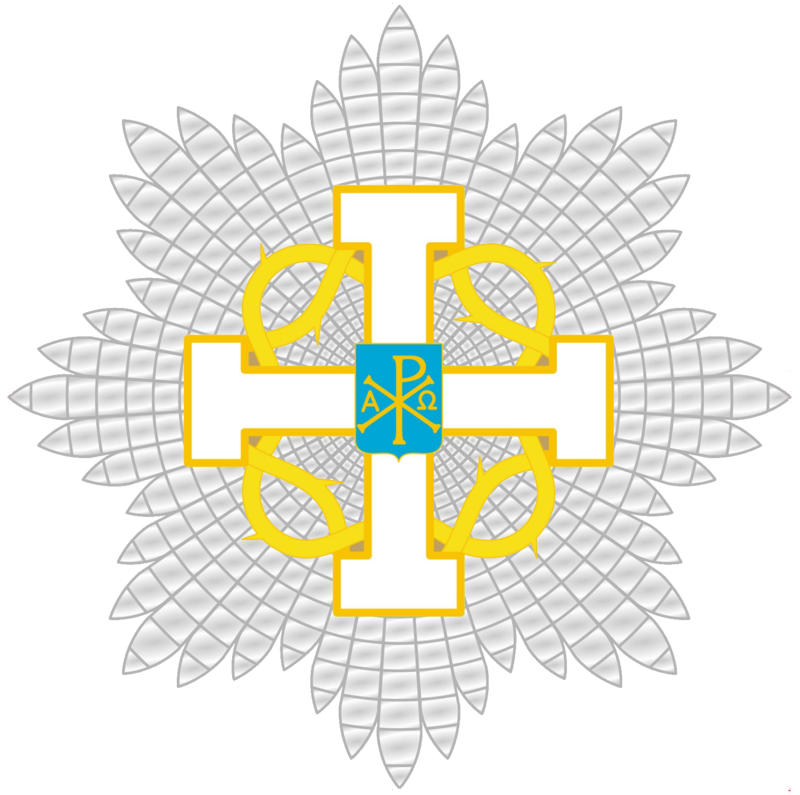 Members of the San Luigi Orders are entitled to wear insignia as described below. 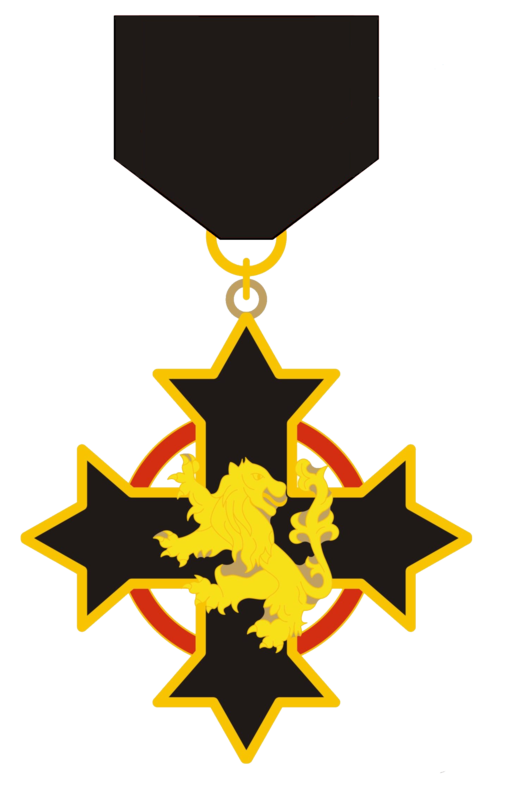 For many years, the Orders have made no distinction between the manner of wearing insignia for men and for women; however, it is possible for women to wear insignia suspended from a bow if preferred. Detailed information on the correct mode of wear of insignia with uniforms and various types of formal dress is available from the Chancellery. 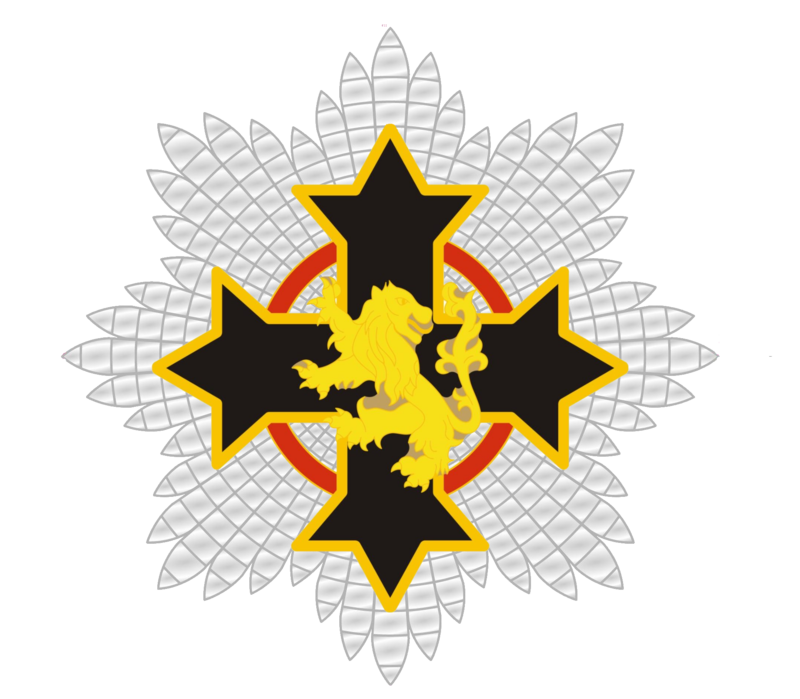 The Order’s Mantle is prescribed only for members of the rank of Knight/Dame Commander and above. 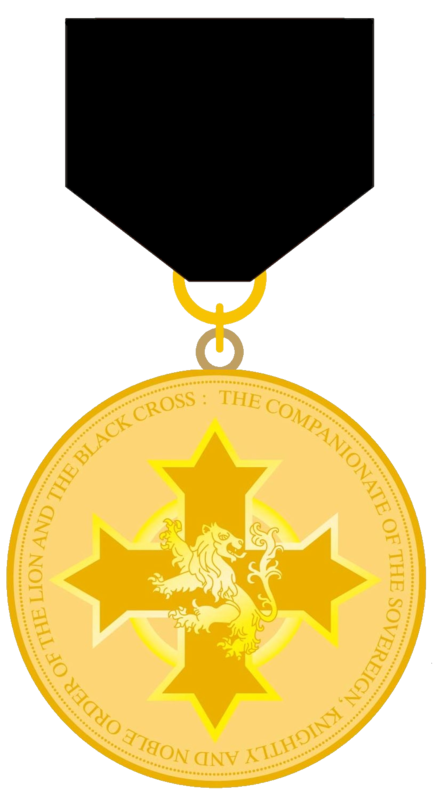 Medal of a Companion of the Order in gold depicting the insignia of the Order on the obverse and the arms of the Abbey-Principality on the reverse. 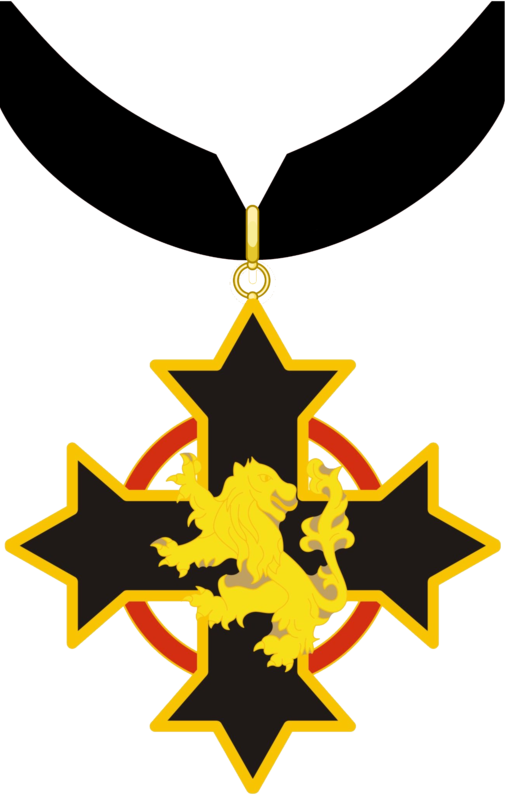 The medal is worn on the chest ribbon of the Order. 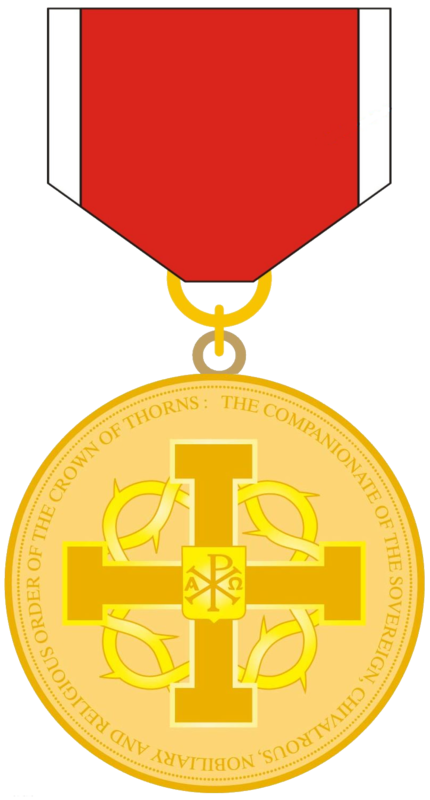 Decoration of a Knight or Dame of the Order, enamelled and decorated in gold. 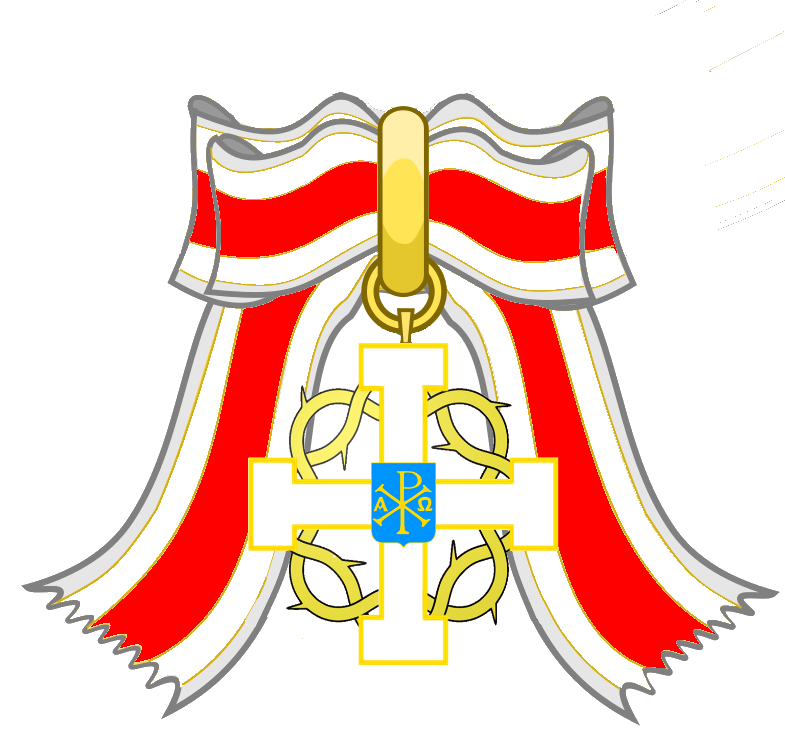 The decoration is worn on the chest ribbon of the Order. Decoration of a Knight or Dame Officer or Commander of the Order, enamelled and decorated with gold. 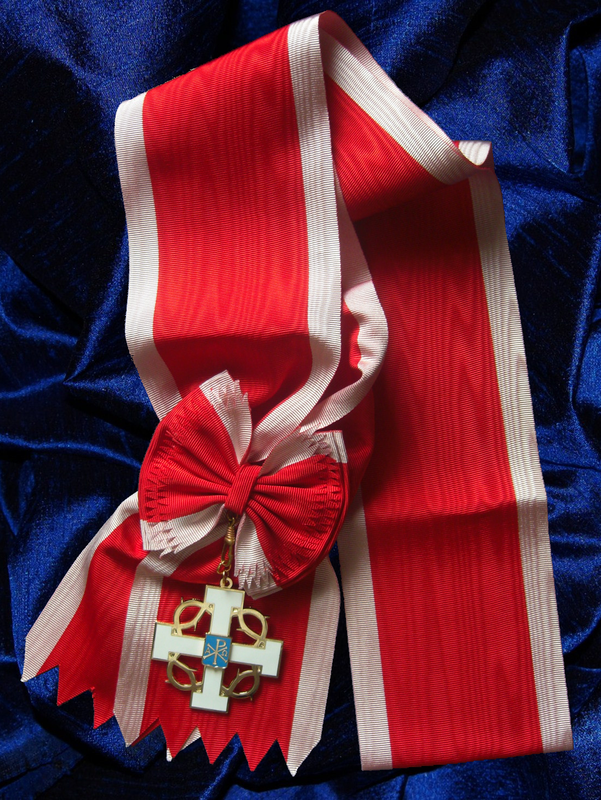 The decoration is worn on the neck ribbon of the Order. 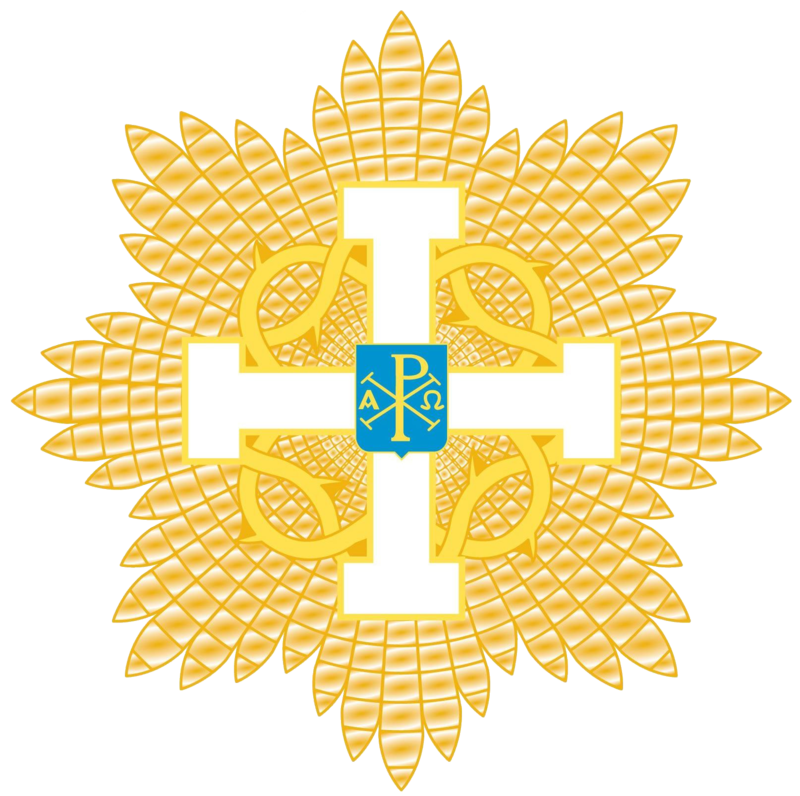 Breast star decorated with silver and enamel, bearing the Order’s emblem. 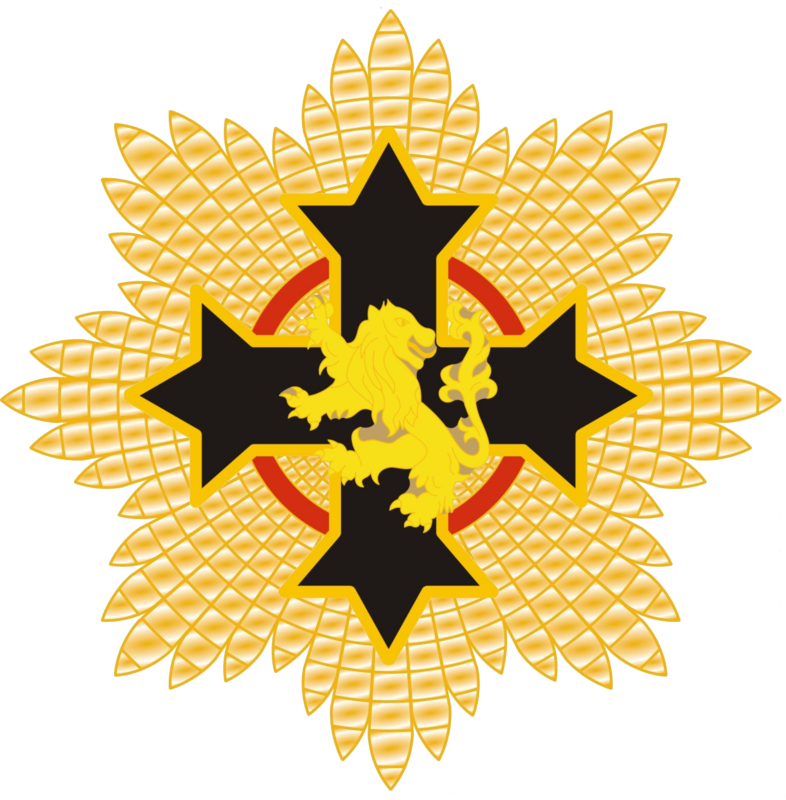 Breast star decorated with gold and enamel, bearing the Order’s emblem. Four inch moiré sash of the Order from which the Order’s decoration is suspended by a rosette. Two ribbons have been specified for this Order. The original and currently specified ribbon is in black moiré silk with gold edges. During a time when this was unavailable, an alternative ribbon in plain black moiré silk was approved and this may still be worn if preferred. 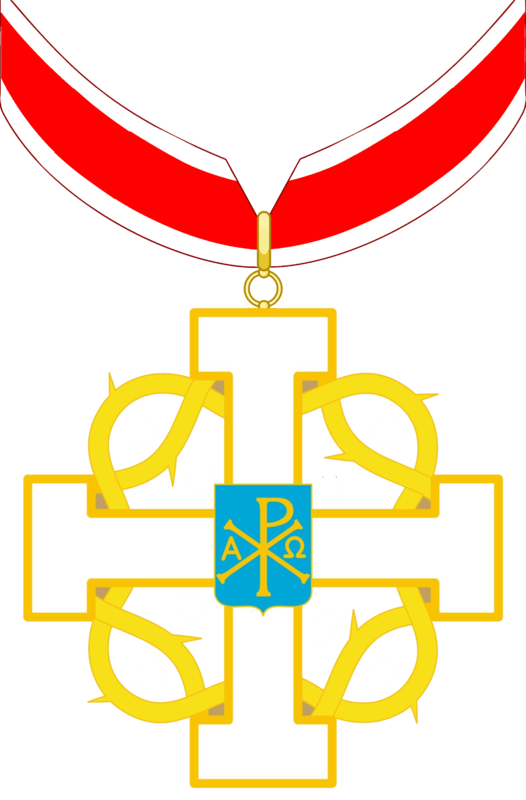 Enamelled brass lapel badge depicting the 1883 device of the Abbey-Principality of San Luigi. 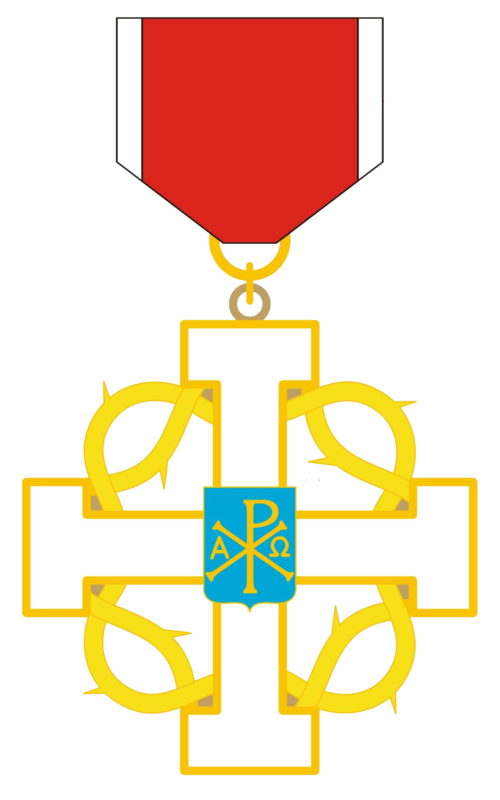 These are worn by all members of the San Luigi Orders.